Fossilized skeleton of young dinosaur excavated from the Gobi Desert in Mongolia in August, 2006. Head thrown back and tail arched up is typical of death throes. The blue and white scale is 10 cm long. It is a theropod dinosaur called Tarbosaurus (terrifying lizard), which is similar to Tyrannosaurus rex. There is some debate in paleontological circles about whether the Asian Tarbosaurus really is different or whether it should be assigned to the same genus as T. rex. 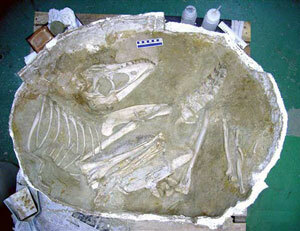 The fossil was about 2 metres (7 ft) long and is interpreted as being a young animal, about five years old. Adults of the species are believed to grow up to 12 metres (40 ft) long and weigh up to a tonne. The skeleton was buried in sandstone, and a huge chunk containing the skeleton was excavated in August 2006 and returned to the museum. 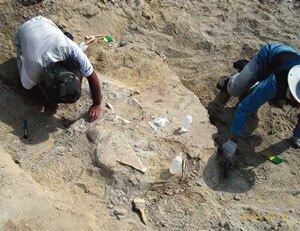 Subsequent work revealed that the skeleton was remarkably complete with only neck bones and the tip of the tail missing. Well preserved fossils are considered remarkable today because when animals die they quickly disintegrate, either by decay or predators or both. What happened to the young, strong dinosaur? Couldn’t it swim? What happened to the young, strong dinosaur? Couldn’t it swim? The scientists from the museum did not offer any speculation about the cause of this animal’s death or the environment in which it lived. Tarbosaurus is typically described as living in a humid floodplain, criss-crossed by river channels.3 The reason for this interpretation is that their fossils are found in strata that point to an energetic depositional environment (e.g. cross bedded sandstone—see figure) that cover extensive areas of the continent. These strata usually contain abundant vegetation as well as marine and terrestrial fossils. It’s the same story all over the world. Scientists excavate skeleton of dinosaur buried quickly in sandstone sediment in Mongolia during Noah’s Flood about 4,500 years ago. 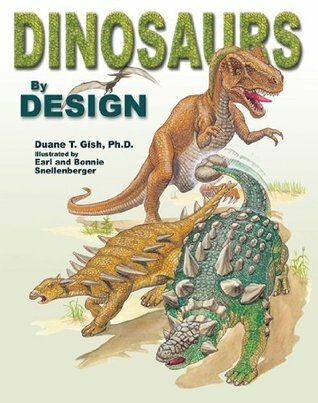 The problem paleontologists have with trying to account for these dinosaur fossils is that they are trained to look at the evidence from only one particular worldview, called uniformitarianism. In that worldview the past is assumed to have been similar to the present, i.e. that the geologic processes and environments in the past were similar to today’s. That is why the scientists said the dinosaur was in a geological layer deposited about 70 million years ago in the late Cretaceous period. The idea of millions of years comes directly from the assumption of uniformitarianism—slow-and-gradual deposition. However, the evidence points to the animals being overwhelmed and buried quickly. Quickly means it did not take much time. So the evidence itself washes away the idea of millions of years. The Japanese paleontologists don’t appear to have considered that their dinosaur was buried in a global watery catastrophe—the Flood of Noah just 4,500 years ago—as the Bible records. However, I think they would be pleasantly surprised if they did try interpreting the evidence through a non-western worldview—like their ancient Chinese one for example. Even the pictographs that make up their ancient scripts are filled with clues that their ancestors were familiar with Noah’s Flood. (See Noah’s Ark hidden in the ancient Chinese characters and The sixteen grandsons of Noah). 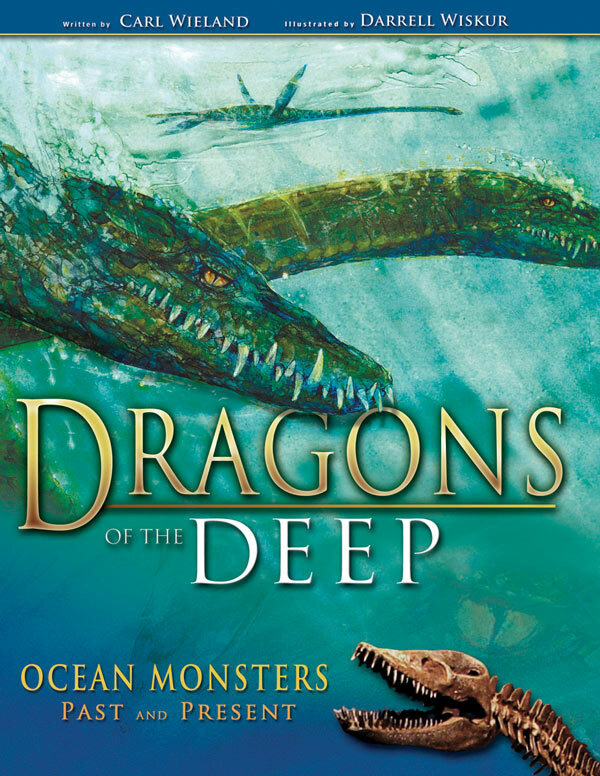 And they were familiar with dinosaurs too, except that they called them dragons, naming one-year-in-12 in their honour. Yamaguchi, M., Scientists Recover Complete Dinosaur Skeleton, The Associated Press, 24 July 2008, <http://www.livescience.com/animals/080724-ap-japan-dinosaur.html>. Return to text. Marshall Faux, C. and Padian, K., The opisthotonic posture of vertebrate skeletons: postmortem contraction or death throes? Paleobiology 33>(2):201–226, March 2007; <paleobiol.geoscienceworld.org/cgi/content/abstract/33/2/201>. Return to text. Tarbosaurus, Wikipedia, <http://en.wikipedia.org/wiki/Tarbosaurus>, accessed 25 July 2008. Return to text.